The internet has been accused of destroying local business through relentless commoditization and ever-lower pricing pressure. You may even cringe when a customer walks into your store and pulls out a smartphone, knowing that they’re looking for a better deal on what you offer. If you ever get a chance to talk to those shoppers, however, you may have discovered that it’s possible to convince them to buy here and now rather than saving perhaps a few pennies. How? By telling them a story. Want proof? Consider this: One of the most commoditized products in America is the egg. After all, eggs are eggs. Sure there are brown eggs vs. white ones and they may even have a different flavor. But for the most part when you’re buying eggs you’re looking for the size you want and the lowest price. Unless you’ve heard about the way hens are treated at many commercial farms. It’s a bleak existence, packed into tiny cages, sitting in their own filth with no room to stand, much less turn around. Often inside a huge warehouse-like barn where they live their entire lives without ever seeing the sun, smelling fresh air or feeling grass. What’s It Worth To Feel Better About Your Purchase? If this bothers you, now imagine that on your next trip to the supermarket or even local farmer’s market, you’re introduced to a business called “Happy Eggs.” (I just made that up, so if that is the name of a real business I apologize!) Happy Eggs come from a free-range farm, where the hens are allowed to roam in a real chicken yard, they’re fed high quality food, and you see pictures of the owners and employees kids playing with and petting them. Happy hens producing Happy Eggs. Now the question becomes, how much more would you be willing to pay for these eggs over the sad, caged, commoditized eggs? That is how stories insulate your business from the commoditization of the internet. And the local marketplace, for that matter. People want to shop with people they can be proud to support. People who share their values, or have cool personalities, or entertain them in some way. Conservatives love to eat at Chick-Fil-A because of their family values, while progressives are flocking to Target because of their policies on equality. No matter which side of those issues you come down on, there’s a list of stores that agree with you. When you tell stories about your business and about your products, you attract the kind of people you’ll most enjoy doing business with. Chick-Fil-A isn’t too upset that LGBT rights supporters don’t eat there, and Target isn’t particularly sorry that people who want to enforce strict gender roles aren’t shopping in their stores. Rather, both businesses are enjoying growing their businesses with like-minded customers. Of course, those are just examples from recent news – your business and your story doesn’t have to be political at all. Now be honest – if you lived in her area, wouldn’t you love to take your kids to her for their haircuts? 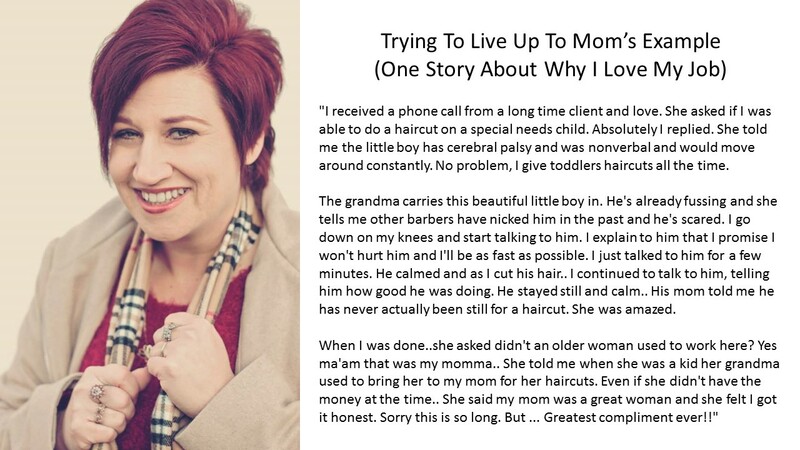 We heard her story and encouraged her to post it on her business page, and we shared it on ShopOnMain’s social media. Because it’s a great example of who she is as a person and how her business is run. 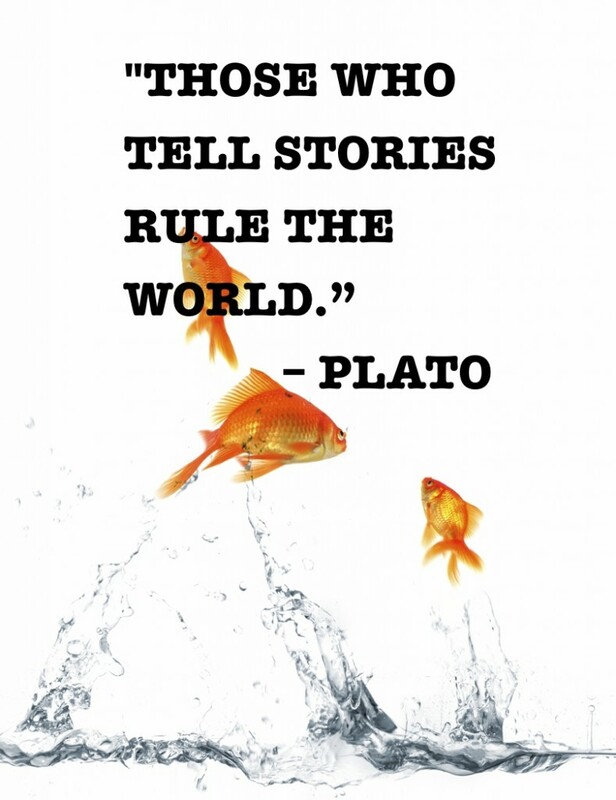 And it’s a great example of how stories can build your business. In fact, we’d go so far as to say that in the age of internet comparison-shopping, stories may be the ONLY way to build your business. Someone else is always going to have a lower price on a similar item – even if it’s something you make yourself, someone out there makes something similar. But nobody else is YOU. No other business is YOUR business. And when people find out just what makes you unique and special, they want to do business with you. And often, they’re willing to pay just a little bit more for it. If you have a story about your business, share it to social media with the hashtag #MainStreetStories and we’ll share it to our accounts as well! Let’s tell America why Main Street is worth shopping on!